Rupert Pupkin Speaks: Olive Films - THE MIGHTY QUINN, SLAUGHTER & BLACK CAESAR on Blu-ray ""
There's not much arguing that Denzel Washington is one of our greatest actors. He's a pro like nobody's business and takes his craft quite seriously as evidenced in countless outstanding performances. I honestly can't think of a movie wherein he was not good. He is something else. He's so good, it really makes you wanna go back through his early work and look for some gems. 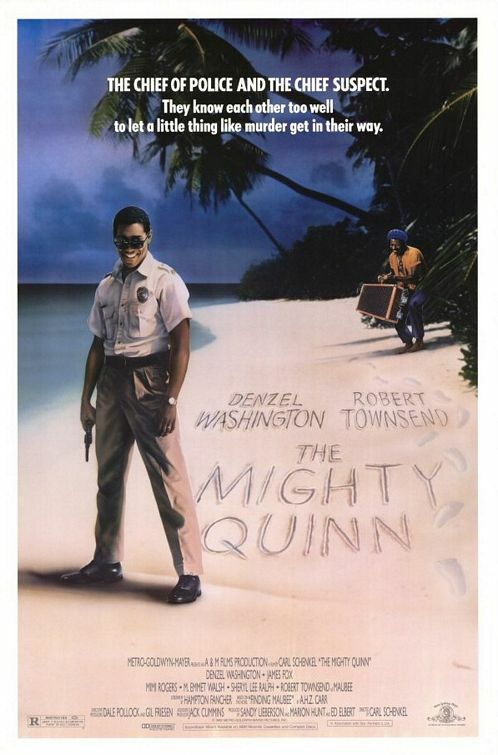 THE MIGHTY QUINN is just such a gem and it was relegated to realm of movies that few outside of video store employees knew about until not that long ago. The store I used to work it had this movie on VHS and I must have passed by it fifty times before I finally too it home. I was glad I did. Pretty sure one of my other co-workers recommended it and it became something of an in-store favorite for a time. 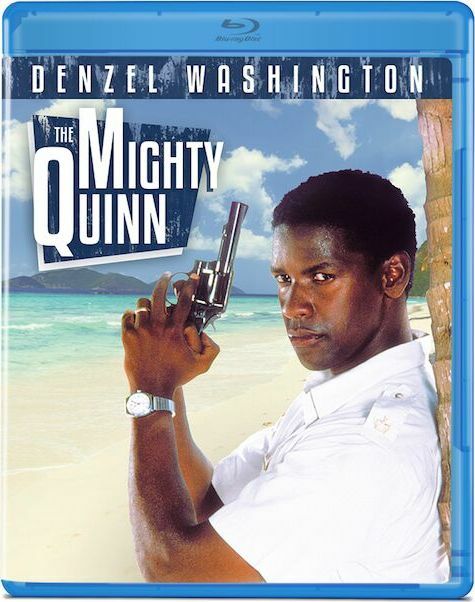 It features Denzel as the chief of police on an unnamed Carribean Island and really early he finds himself investigating a rare local homicide. When he feels himself being strong armed by some wealthy and powerful politcals, he pushes back and does his best to sort out the crime. The local bureaucracy wants him to close the case and arrest one of his oldest friends, a local small-time criminal (Robert Townsend), but the evidence is circumstantial at best and there doesn't seem to be much of a motive. This is a neat little "sunshine noir" type movie with a complicate conspiracy at the center. It's neat to see this kind of labyrinthine mystery played out in mostly-sunny, tropical locale. The script is by Hampton Fancher (who also wrote BLADE RUNNER) and the cast has some cool folks like M. Emmet Walsh and Mimi Rogers. Apparently Roger Ebert was a huge champion of this film back when it came out and called it one of the best films of 1989. That's the only critical praise I've come across though I'm sure there was more, but the film is still as yet to be uncovered by a larger audience. Hats of to Olive Films for digging it up. This Blu-ray looks nice. Quentin Tarantino has made it well-known that he is a big fan of Jack Starrett. He has cited Starrett's film THE GRAVY TRAIN (aka THE DION BROTHERS) as a personal favorite on more than one occasion and has screening it along with Starrett's 1976 films HOLLYWOOD MAN and A SMALL TOWN IN TEXAS. I know he likes Starrett's films in general though, especially his biker movies and I would think also Blaxploitation efforts like SLAUGHTER. SLAUGHTER is one of the more high-profile films that Starrett ever did (along with CLEOPATRA JONES) and it's one of Jim Brown's better films from this period. It's kind of like a male version of COFFY meets James Bond. Jim Brown plays the titular Slaughter and after his father is killed by a notorious mobster (Rip Torn), he makes it his life's mission to avenge the death. Slaughter is wrangled by a U.S. Treasury agent (Cameron Mitchell) to help get the mobster and he complies and is sent down to South America to track him down. While there he meets the lovely Ann (played by Stella Stevens). What follows is lots of fighting and shooting and stuff. 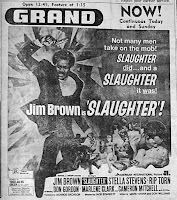 Jim Brown is a solid badass as this character and would go on to make an even more outlandish sequel called SLAUGHTER'S BIG RIPOFF (which features a truly nutty Ed McMahon as the bad guy). 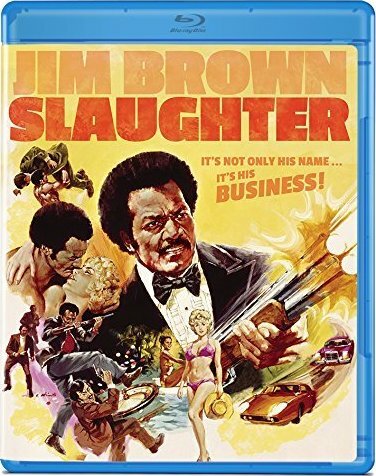 SLAUGHTER looks good on Blu-ray and is probably a must for Blaxploitation fans. Fred Wiliamson has become a remarkably prolific actor. With over 100 films to his credit, he has a bunch still coming out soon enough. Though he had some success with a few earlier films, BLACK CAESAR was a pretty big one for him. This movie was also a big deal for director Larry Cohen and American International Pictures. Cohen had put out his still very interesting film BONE (with Yaphet Kotto) in 1972, but BLACK CAESAR really put him on the map as a director. He would follow it up with a sequel (HELL UP IN HARLEM) at the end of that very same year. Cohen would then move on to more horror genre fare (the IT'S ALIVE movies, Q) but would make some other interesting thriller type movies later in the 1970s. Just to give a little context, BLACK CAESAR came out in 1973 and this was post SHAFT, SWEET SWEETBACK'S BADASS SONG, SUPER FLY, SLAUGHTER and BLACULA. 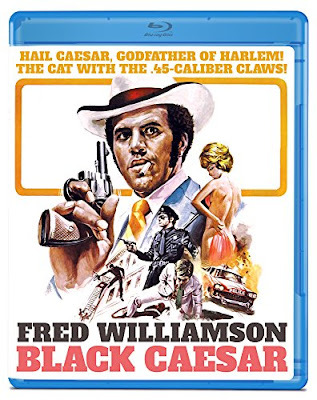 Fred Williamson had starred in HAMMER in 1972 which was also among those earlier entries in the genre (and also came out on Blu-ray via Olive Films this year by the way), but BLACK CAESAR was like his GODFATHER (albeit a grindhouse/drive-in type GODFATHER). The tagline was even "Godfather of Harlem!". The early 70s was a very fertile time for black cinema in general and seeing another extremely powerful and tough character like this was understandably popular. 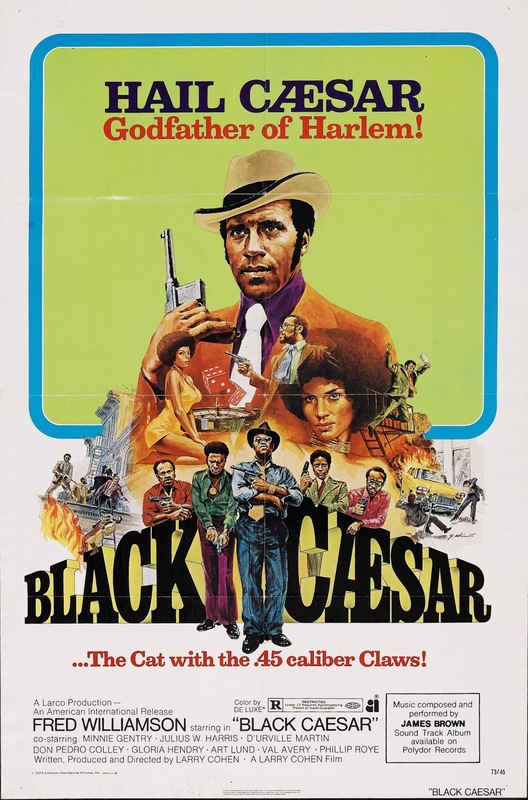 Tommy Gibbs (Fred Williamson) in BLACK CAESAR is ruthless and will stop at nothing to climb to the top of the proverbial heap. He's an evil kickass dude to be sure. 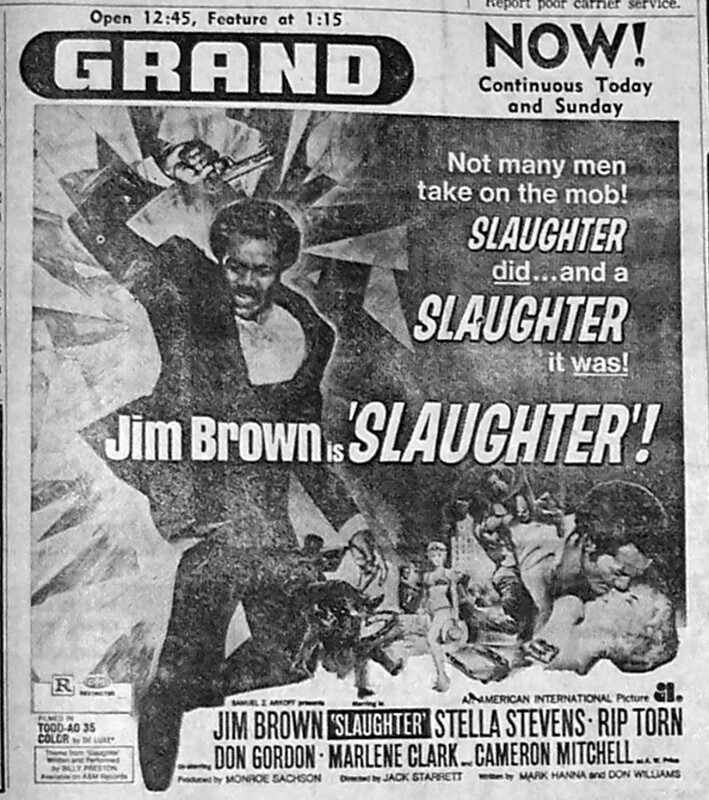 On top of all that, and certainly a factor in BLACK CAESAR's popularity was its excellent soundtrack done by the Godfather of Soul himself James Brown.